Now that you've seen how to run your machine and have prepared it for cutting, you can take a swing at making your first project! You can go off and do whatever if you want, but if you'd like to try out the following project, it will give you a feeling for Kiri:Moto and get you warmed up with your machine. 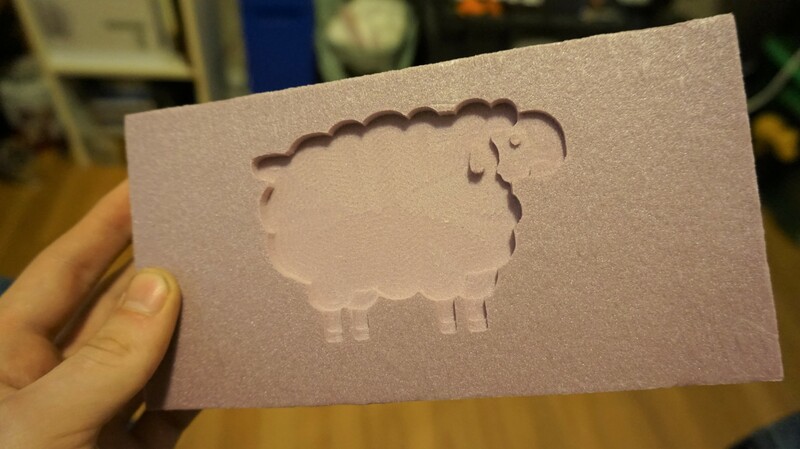 This is one of our first projects, a sheep cut into foam that we call the CNSheep. We like to use this as a benchmark test to indicate that your machine is working and has been properly assembled. Foam is a soft material and thus an extremely forgiving material to carve. You can typically set aggressive feed rates and depth of cuts when cutting foam with no major issues. Pick the lowest speed on your router when working with foam since the foam may melt onto the end mill if the speed is too fast. You can access Kiri:Moto here and the project files consisting of our pre-compiled g-code and the CNSheep STL can be downloaded here. Congratulations on your cute new sheep! You should now have a fully functional Mill One, and a basic understanding on how to use it. What new things will you make now? The next page will give you some insight on how to maintain your Mill One so you can ensure that it continues to run properly. Finally, on the More Projects page that follows it, you'll find the starter projects that we've made which will help you to start cutting the wide variety of materials that are within the Mill One's range of capabilities.